I just wanted to inform you that the sword arrived today and I'm very impressed with its presentation. Thank you for allowing me the honor of being able to enjoy such a wonderful blade. If you know Kumamoto Yatsushiro please let him know his blade will be well taken care of and respected. Thanks for a such wonderfull piece of Japan history and an interesting piece of study of its smithing school. It is everything perfect as usually. Super fast ship, super carefully done package, and super clear communications. It is important understand that some minor "defects" are not real defects, but plus of traditional swordmaking and other "defects" are nithing more than plus of the time flow. I promise to respect this token and to mantain it to next keeper in better way i can. Hope to have other deal with You in near future! I just received the Naokatsu Tanto. I like it very much. i hope to deal with you in the future. I received the Yari and the Koshirae and am very happy! Now I am starting to save some money again to buy another Japanese sword. I am looking for a Nagamaki with an ubu nakago, not a nagamaki-naoshi. If you know someone that has one for sale for a reasonable price please let me know. I will be watching the E-Sword website. Thank you again, it was a pleasure doing business with you. I look forward to another successful business transaction with you. I received the Yari and the Koshirae in very good condition! I am very happy with the product and the service! I am interested in buying another Omi Yari that is from the Koto era and has a nagasa (spear blade length) of 74 cm or longer. I can afford the price of up to $4000.00 US dollars. I see you have another Omi Yari for the price of 750,000 Japanese yen. I can not afford that price but should one become available in my price range I will be interested in purchasing it. Thank you very much, and have a good day. Both courier parcels have arrived. The Naginata is in lovely condition, thank you for such fantastic service and products. It is a great pleasure dealing with you. And I look forward to my next purchase. Initially i've got some noise at italian custom for the invoice change, but now it is all ok! I've just finished to use uchiko and choji oil, this token is spectacular!! It will be a very interesting study object at next kantei at I.N.T.K.. Very beautyfull katana for one of the 2 great Harima Master of Shinto Period! It has been a pleasure to bought it froim You! I hope i'll buy again from You! Finally I was able to overcome all the paper work plus authorizations and receive the sword in my home. The sword is awesome as expected!!! Thank you very much for all your help and good service! Hope to do business with you again soon!!! Today the Tsuguhira arrived here at our home! We wan't to let you know that very are very happy with this very nice and healthy sword! Very well packed it arrived here savely! We hope to deal with you again in the near future! I received the item today. Also, I wanted to say that your communication was EXCELLENT! I especially liked the receipt for tracking information. This was a MUCH BETTER transaction than my first purchase! I will be sure to leave some feedback at the Nihonto Message boards! Hello Sir, my Katana 1510-1086 (shiga taro minamoto hideaki ) arrivied this morning. It is a wonderful blade. Domo Arigato Gozaimasita for selling me this magnificent sword, and your excellent service. Kindest regards and thank you. I just want to inform you about, that I have received the Ichijo school tsuba. I’m very happy with the quality and I must say that your pictures did not make this tsuba justice. I am a photographer and I hope you don’t find me rude to give some input regarding this matter. Many Nihonto websites make the items they sell look better in photo than they are in real life. I’m used to judging photo, but most people are not and are easily fooled. 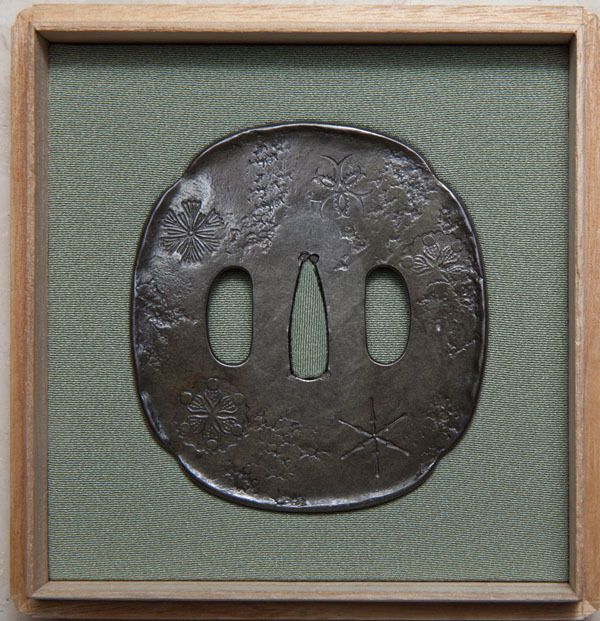 With this Ichijo school tsuba it was the opposite and I was looking at this tsuba for months, but thought it looked to dirty to be interesting. When I now hold it in my hand, I can see that it is absolutely nothing wrong with it. 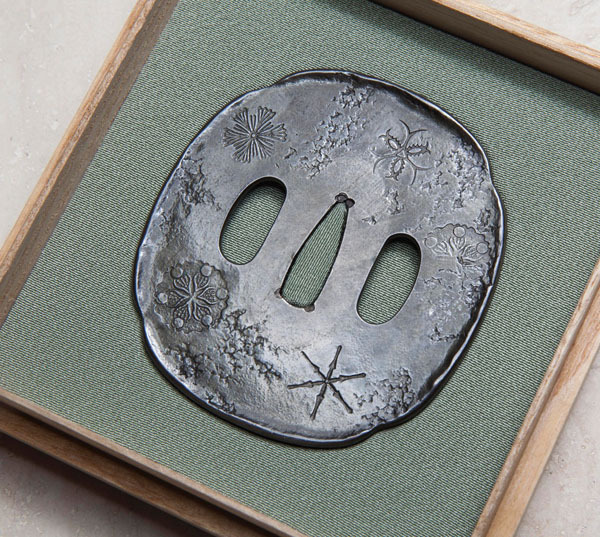 This is meant as a friendly advice regarding photographing tsuba and kodogu. I think the photographs of the swords on your website is perfectly fine. The easiest way to make nice images of tsuba and kodogu, is to make sure that the flash/daylight is reflecting in parts of the items. That makes it so more easy to judge the condition and patina of the metal and the items looks much better. It is also important that the images are color corrected to daylight to get the correct colors on the items. Please feel free to contact me if you like to get some more detailed information on how to do the pictures. You where kind to give me substantial discount on this tsuba and this is my way of showing that I appreciate your kindness. I include here some quick images I did of the tsuba after I lightly cleaned it a little, to show me my point. I have not done any retouch on the images and it took less than 10min. to do. This is the picture on your website. Here is if I put the light in a to low position, but the image is color corrected og the right exposed. This is the correct way in my opinion, with more reflection, and this is also more the correct way it appears when I see it in reality. Now it easy to see the full beauty of this tsuba. As I said, I hope I not have offended you in any way with this input and please feel free for you or your photographer, to contact me if there is a need for more detailed instructions. Thank you so much for your business and please Sir, do contact me if you come across more Ichijo Sekka-mon tsuba or kodogu! I am also looking for a reasonably priced hira-zukuri long wakizashi or katana. Preferably in a reasonably good polish, but to keep the price more modest, in shirasaya, mumei and with some flaws are acceptable. I will keep a look at your website, but if you come across some sword which might be to low quality for you to want to post it on your site or also otherwise, please do not hesitate to contact me any time. I got the sword today, it is really beautiful and its a great honor for me. I would like to thank you that you made it possible and for the great Customer Service! Finally the sword with its koshirae arried here savely. I'm very happy with this package and hope we can deal more in the near future! I received my item two days ago. I am happy with my new purchasing. The blade of this catana is excellently. It is best item of my collection XIX century. I sincerely grateful to you for the wonderful thing. Got it all! Beautiful !
! I'm really happy with the purchase made ? ?by you. I wonder 'who, in a bit' of time, decides to buy a 'else. Thank you also for the very careful packaging. It was a great pleasure to have this deal with you. I have received the katana, it is beautiful, I am very pleased to have such a beautiful item . For the person of studying and practicing aikido the long period to have the real Japanese sword with good history it is a great honor. I am grateful to you for this opportunity. Thank you very much. I am sure I will continue to visit your website and will purchase other subjects in the future. If you want you can use my message for "voice of customers". The menpo arrived in Italy, everything was perfect. I am very satisfied, it is really very nice. I would to thank you for this purchase. I hope I can still get other things from you. I like the 62 ken kabuto in your shop, although I would like a kabuto sabiji, without urushi. If you find something can you let me know? Thanks again and greetings from Italy! Hope this message finds you and everyone at E-Sword doing well. I received the katana today. It is spectacular, and exceeds my expectations. Let me extend my sincerest appreciation to you for all of your assistance with this purchase. I look forward to possibly purchasing items from E-Sword in the future. I received the parcel early yesterday and I am in awe of how beautiful the katana is. The craftsmanship is utterly gorgeous and I can't wait to start using it for tameshigiri. the Tetsusen,very interesting,i am so pleased. a good compliment for the Tetsusen. Hope you are very well . Itsumo totemo kansha shite imasu. Your sword arrived here, last Friday, in good shape and without complication. It’s really a fine sword and I like it very much. J'ai bien reçu mon katana et je vous remercie de votre professionnalisme. Le katana me convient très bien : j'ai enfin réalisé un rêve qui date de 20 ans. I received my katana and thank you for your professionalism. The katana is fine with me: I finally realized a dream that dates back 20 years. I received today the katana, it is beautiful, I am very pleased to have such a beautiful object, especially me, who am a lover of Japan. I keep it with great attention, respect for people who are made​​, I promise you. Best posts and thank you again. 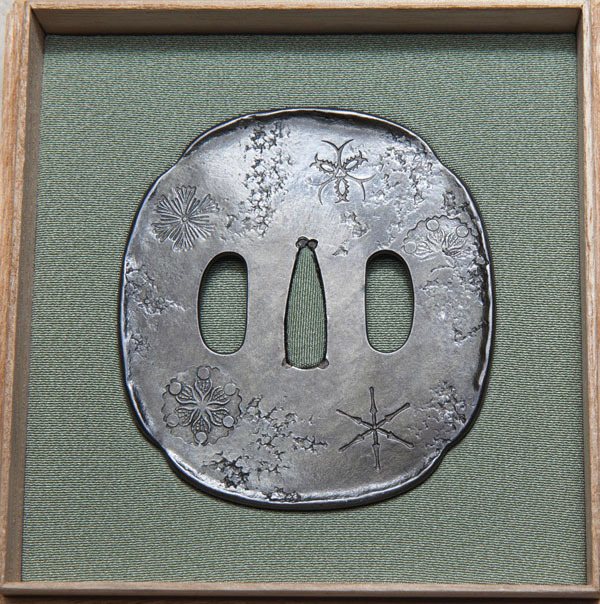 Just a quick email to inform you that the Tsuba [Item No.1010-6028] arrived　safely today. I am very pleased with it as it will suit a particular sword I have. Thank you for sending this item so quickly, it is greatly ppreciated. I look forward to possibly purchasing other items from you in the future. and your staff and families are safe. Once again, thank you very much, take care. I'm pleased to tell you that Fedex did an excellent job; the shipment was delivered to my home address yesterday already (i was not home) and i Picked it up today at Fedex Brussels. The wakizashi is a splendid object; I am very pleased and proud to own it and i shall take good care of it. I have received the sword. Everything is as it should, thank you very much. It was a pleasure doing business with you. Hope to do business with you again soon. Good Morning & Hello, Sword has arrived today safely . I am very happy with purchase and thank you for the replacement of brass part.This sword will "honour" my home.Thank you once again for a smooth transaction . I want to inform you that I finally received the parcel with sword from you. I am very grateful to you for your honesty and helpfulness. It is very important when one does business and deals with other people. I am sure I will continue to visit your website and study the proposed items and get to know Japanese culture better. If I have any questions I’ll contact you straight away. Sword has arrived, I'm very pleased with it thx. You may always use my name as reference for your reliability if you need. Hollyday. So i will drink japanese sake for Your helt and prospetity. With best regards and great respect. I received the sword yesterday, we are really grateful for your kindness and understanding during whole shipment process. My boss is really pleased and amazed about the quality of the sword and the support from your side. I would like to thank you very much. I just resived fantatic swords from you. I am very happy. But i kindly asking you for one more favor. If you be so kind to send me by Fed Ex ( I will pay for shipmant) separate description of each sword on your Company E Sword paper with your signature. For instany very important for me is 1395 year when beautiful tan tou was made. Many thanks for your nice swords again! They're all much better than pictured. My friends is very content and so am I. The Armor has alredy arived today ( that was fast ) I would like to thank you so much,I am so glad with this armor. I hope to do busines with you again in the future, everything was so OK, the invoice the package and so on..again Domo-Arigato-Gozaimasu. Have a nice day and my Best Regards. I have received the koshirae and am very happy with my purchase. I HAVE RECEVED THE SWORD THIS MORNING, EVERY THING IS FINE. I WILL SOON PLACE A OTHER ORDER. Nihonto arrived via Fedex without any problems yesterday. The Blade and koshirae looks wonderful and I am very satisfied with it. I am very pleased to have made business with you and I surely will come back to you for some more swords to buy. Therefore, I would kindly like to ask: I am looking since a long time for a Kyu-Gunto with traditionally made blade and metal koshirae in good condition. Do you see the opportunity to offer such a sword? I am from Russia. My family and I are living in China for more than 10 years. I am a representitive of a Russian company (pharmaceuticals). My son has gratuated from a university in Beijing. He married a Russian girl (a representitive of a Russian company too). Yours item was not the first I have received from abroad. Before ordering swords from abroad I have contacted with my police department and the customs (EMS and post customs). I advised them that I am going to import the above items only for my collection, I would not do business with the swords, I will pay tax (10%) from the CIP value of the goods. The customs approved my import. As I know in case of importing of a weapon like a sword, knife and so on one must arrange a letter from police department to the customs, I have saw such a letter in the customs, issued for a Beijing citizen. Importing of cold weapon (as I unrestand) is not prohibited in China, especiaaly if it is an antique. Usage of such items (and arranging of the letter)is the police consideration. In any case please take into consideration that situation in China is favourable to the foreigners. Waiting good news from You. Thank you for your last mail,today i recived the tantou.I liked it,very nice and i admire the age,in so good shape. With me its very fine and now i am waiting for our cherry blossom to come,i have at our countryhouse seven very old and big trees.Now we will have warmer and soon they will blossom.It is a wonderful time,so beautiful.I am also dreaming to see yours, some day. Have they come yet? Hope you are in good shape to ! Have a nice day and best regards . Today , 20/2 i recived the tantou.Everything went very well,your incoice was perfect.I am so happy,and pleased,a very nice masterpiece from Mr.Yamashita Shigenori.Please send him my regards. If you come in touch with him.You will soon hear from me again. Hope you have a nice day and best regards. Thank you for your email. I am looking for swords by two (2) different sword families: First is the Horii group starting with Taneyoshi and ending with the current member, Tanetada Horii. Within this group are the Mikasa swords made from the steel of the Mikasa battleship. I am also looking for any of the small memorbilia that was offered as souvenirs also made from the steel of the battleship. There are small cannons, airplanes, helmets, ect that were made from excess steel from this ship. Also the second group of swords of interest are the Gassan group starting in the Shinshinto era with Sadakazu San and ending with the current member from Nara. If you have anything from the above "want list" could you please contact me or Dr Wada San who is helping me with my collecting. Respectfully. I have received today the package. Excellent spearand very fast shipping time!Very satisfied!!! I am very glad with my purchase. Thank a lot for fast shipping and great packaging! You are selling a real Japanese things! Best wishes to you and Japan from me and my country-Latvia!!!! The sword arrived and I am very happy with my purchase. We are coming to Tokyo later this year. Do you have a shop in the Tokyo area? I am sure we will do repeat business, Respectfully. The blade is just arrived today, and I am very satisfied with it. beautiful blade and superb koshirae. perhaps, to come back to your shop for another blade. I just received this EMS . Daisho tsuba's are very nice , Thank's ! Today I recieved my sword and it is beautiful I am very glad with it and thank you . Apologized that I reply so late.I received all the item already,thank you very much and those items are more beautiful even than the photos, I hope can seek more excellent items in your shop next time.thank you. thanks a lot for your efficiency, I rec' the sword already, I am really satisfy on the condition this time, I hope next sword I order can get the same level. The Edo-Higo tsuba arrived in good order. I am very pleased with it! I am pleased to tell you that both swords have finally arrived and they are in safe keeping with my friends. I was lucky to have the opportunity to see the swords as I have just recently visited England and they are both more amazing then I could imagine. I am reading as much material as I can on all the different aspects Japanese swords so that I have a better understanding of the two blades you have sent me. Once again can I thank you for all your help and satisfaction with your company. I hope in the next few months to find a Tachi with nagasa roughly 85 cm, strong koshi-zori, and slender low shinogi. Pleasure to have your acquaintance. I Hope to deal with you again. Today I am happy to inform you that the package you've sent me has arrived. I have unpacked it and it is beautiful. I want to thank you for your effort and help! I shall take good care of it, and thanks for the wonderful object. I am pleased to let you know that the sword has arrived in Marmaris without any damage. It arrived last week and on Friday I went to the post office to collect but unfortunately customs will not release it to me. As is common with Turkish authorities critical information of importance is only given when it is too late. I am currently trying to correct the matter but this may take a few days, the sword will remain in bonded customs in Marmaris. I am told by customs that if I cannot resolve this matter within one month it will have to be sent back to your address. I am not pleased with this and they should have told me when I enquired before it's purchase. If this is the case please accept my humble apologies for any inconvenience this may cause. Any charges this may incur I shall accept. I will let you know exactly what it happening in the next few days. On a more positive note the post office allowed me to examine the sword on Friday and I can say that the pictures of this sword on your web site do not do the sword justice, it is more beautiful than I could have imagined. Holding it up to the light to reveal the full colour of the hamon can only be compared with looking at silk at different angles. I feel privileged to just see an authentic Japanese katana with my own eyes.The post office officials say that they have never seen something so beautiful. One last concern I noticed that the papers of authenticity are not with the sword, is this because it must kept in Japan or has has it been misplaced when customs searched the package? Please do not let this cause too much worry, I am definitely hoping to purchase wakizashi kanetada item number 0650-2009 please make a reservation when I next e-mail you. I have received, the sword shipped by you. Hope to make further purchases with you. I hope that you and family are in the best of health. I am happy with the sword stick and hope to buy from you. I just received the tsuba 10 minutes ago, everything was fine. the Naginata arrived today , and I am very happy about !! Thank you very much for the fine Naginata I am very glad about the fine quality of this Blade and I enjoy it very much. Thank you for your last item, i am very pleased . It wont be my last item,and it works very well with you,thankyou and have a nice day. today I have received the sword, finally!!! country it's said: who does it alone, does it for 3). You've been correct and prompt, gentle and kind. What a wonderfull person! will buy a tsuba for it). Best regards and have a good summer. best to attract you in Sicily, my wondeefull land! Just to let you know the sword has arrived safely. Thank you very much. Now I want to let you know that the package was damadged I am lucky that the sword was not damadged. I think you need to reinforce the package with a lenght of wood so that it will not bend for future shippments.. Please let me know if you have any more Hizento, TadaYoshi or TadaHiro Etc. it was very good and the way you wrote on the paper was perfect.On Friday 21/4　I go the bank and transfer the money for the YAMATO ITEM 0510-1021.Can I write as I did last time, on bank receipt to you, to your bankaccount ,so you will have it as soon as possible. Would like you to sent it to me ,in the same way as before ,　resonable value.